In this assignment, the students in the class were asked to solve a problem which faced Northeastern University students. First we had to identify and define a problem, then determine the audience, research the focused area, and then visualize the expected experiences of the user, before and after, the use of our product, all while portraying a strong brand. 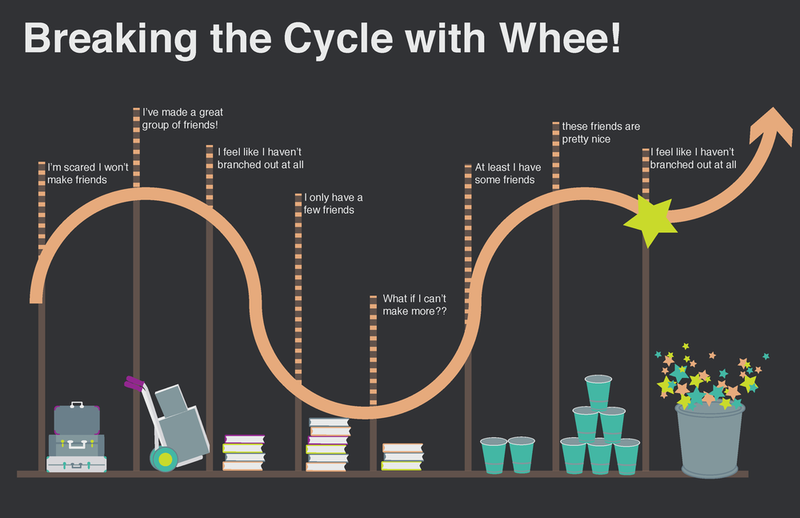 We created Whee, an app that helps new city dwellers learn the city as well as the people in it. When using the app, the user is able to explore different events or places to visit within their new city and connect with other users that are interested in those same events. Along with two other students, I chose the problem of making friends when moving to a new city. Since some of Northeastern’s students study abroad first semester of their freshman year or are transfer students, they may have challenges acclimating to Boston and to the campus life when they arrive. While keeping a cohesive brand, we created visuals to showcase relevant information. Sticking to a strong color scheme with unique colors that would attract a younger audience was key. Strong lines and clean visualization was a way to keep the brand approachable as well as lively.